Do you have loads of duplicate songs polluting your iTunes library? We hear you. This article guides you through the 2 best ways to delete duplicate songs from your iTunes library: A method for automatically removing duplicates using Tune Sweeper is described, as well as details of iTunes' own built-in duplicate search function. 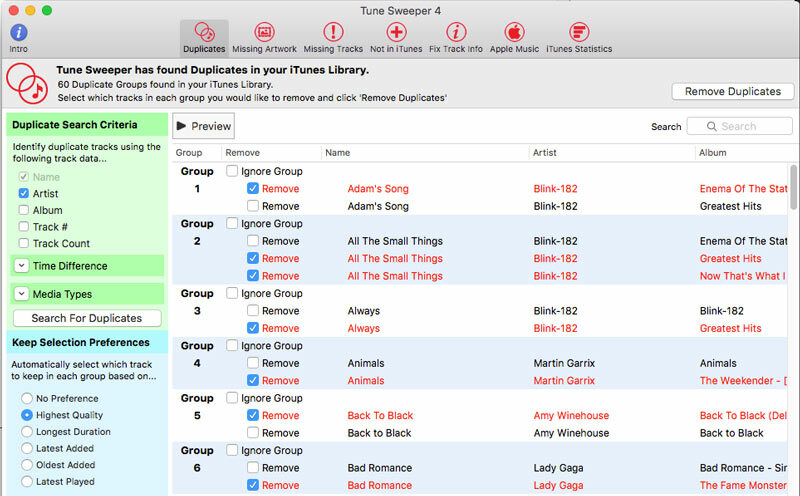 For larger libraries, we recommend using Tune Sweeper, as the tool can find all iTunes duplicates, automatically select the best to keep, and get rid of them for you. For smaller libraries with only a few duplicates, you may find that iTunes duplicate search function is enough for you. If you have a lot of duplicate songs in iTunes, it could take hours of analyzing and listening to each track to decide with track to keep and which to delete. This is where Tune Sweeper could save your valuable time (and sanity). Tune Sweeper provides the ability to automatically select all duplicates to get rid of, and which to keep, in just a click of your mouse. You can choose to keep the tracks of Highest Quality, Longest Duration, Latest Added, Oldest Added or Latest Played. Launch Tune Sweeper and click "Search for Duplicates"
Easy! You've just automatically found all iTunes duplicates, selected the best versions to keep, and delete duplicates in iTunes all at once! Removing Duplicates is not the only thing Tune Sweeper can do though. The program will also allow you to fix missing or incorrect track information, download and fix your album artwork, and clean up your iTunes listings by removing songs with exclamation marks, or adding music from your hard drive which is not yet in iTunes. iTunes also provides a basic way to find and get rid of duplicate music. However, unlike Tune Sweeper, you're unable to configure your duplicate search or remove your duplicates automatically based on your preferences. Removing duplicates with iTunes itself can be very time consuming if you have a large library, or if you have multiple duplicates from different sources e.g. original, live version, extended version, radio edit etc. To use iTunes' own duplicate search function, launch iTunes and display your music library by songs by clicking the Songs header in the menu bar on the left of iTunes. 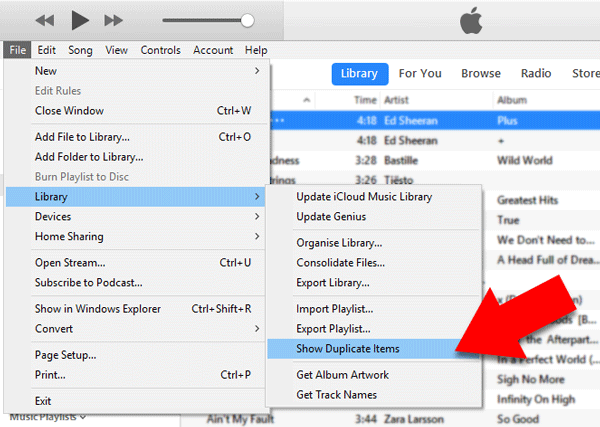 How to show duplicates in iTunes - Now, you'll be able to find your duplicate songs. In the menu bar at the top of iTunes, go to File -> Library -> Show Duplicate Items. This option will display only duplicate tracks from your current iTunes library. If the duplicate pairs are not grouped together, you can click the Name column header to group them. How to delete duplicates in iTunes - From here, you can simply click a track, or hold down the ctrl key while clicking multiple tracks to select them. 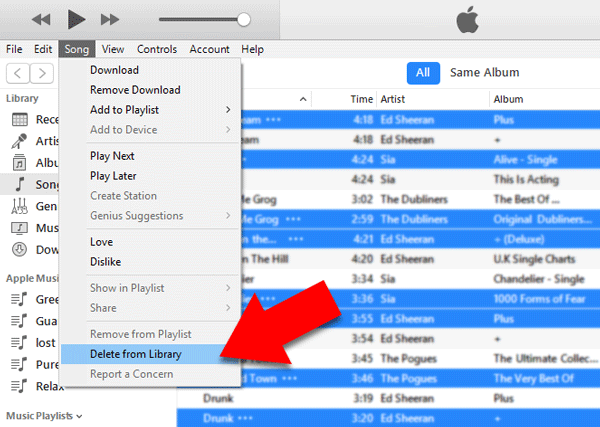 Once you have made your selection, go to Song -> Delete to delete your selected music.